WMSPanel team continues analyzing the state of streaming protocols. The metrics calculations are based on 1.8 billion views. The stats are collected from 2100+ media servers (including our Nimble Streamer, Wowza and Flussonic). HLS share grows again and it's 71% now. 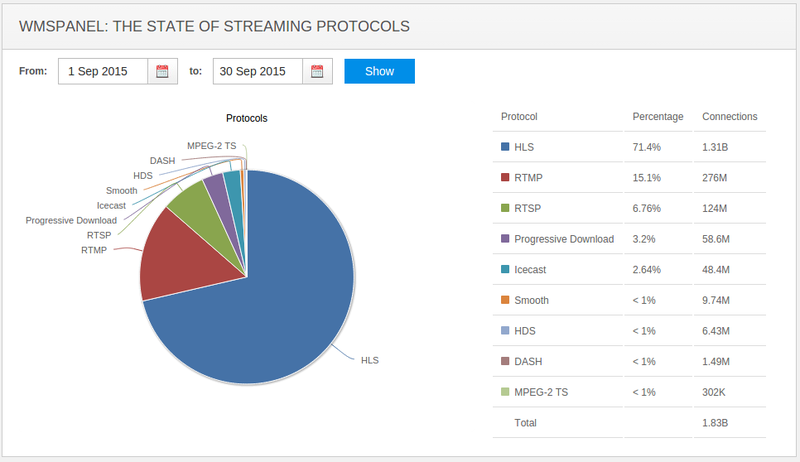 The State of Streaming Protocols - September 2015. You can compare that to August stats below and also check September 2014 stats as well to see how things changed over the last year. Nimble Streamer team experiences a constantly growing demand for new features from our customers who are interested in mobile streaming solutions. Modern devices are able to provide high quality video and audio content, and what's important are broadly used. Hence, mobile streaming traffic share increases rapidly. However, building just streaming application isn't the main objective. In July 2015, our team has released the Mobile broadcasting library and the sample application for Android - Larix Broadcaster. Now, on numerous requests of our customers, we are announcing the Mobile broadcasting library and the sample application for iOS platform. Our customers quite often use Teradek VidiU transcoder and ask us how to setup it to work with Nimble Streamer. In this article we are going to show how to configure it. Teradek VidiU is a portable standalone streaming media encoder on the go that can be mounted on top of cameras. VidiU provides instant transmission of live video signal encoded as H.264 video - to a content delivery network (CDN) of choice. This low cost encoder eliminates the need for expensive encoders and equipment to delivers HD quality video online. WMSPanel is the official UI for Nimble Streamer and it is available under subscription model. Nimble Streamer is the free of charge media server which can run fine on lower-end servers or Virtual Machines. Our customers have long and successful story of using automation deployment of Nimble Streamer, e.g. using Amazon Elastic Cloud. Nimble Streamer can be configured independently of WMSPanel specifying all settings via changing configuration files in manual mode. However, to add preconfigured Nimble Streamer to WMSPanel for obtaining full statistics it was necessary to add each server in the control panel manually via the import configuration procedure. Please back up your rules.conf before using this method to avoid accidental damages. After that regutil automatically transfers the Nimble Streamer settings from /etc/nimble/rules.conf file to WMSPanel, and saves the authorization settings to the /etc/nimble/nimble.conf file for sending data to the panel, without changing the other settings. This capability is specifically useful when you need to organize the broadcast of a single scheduled event and to gather statistics for it (for example, a concert or the final of the National Cup). This scenario can be also used when you create your own CDN. After adding in WMSPanel, each server can be configured via Web interface. Each operation of setting up a new streaming scenario can be applied to all servers instances immediately. You may also consider adding an existing server via web UI. It does the same operation as described here but there you may also analyse the rules before applying them via WMSPanel. If you existing server hardware has failed and/or you got new system on board, you may want to add this server as existing one rather than registering as new. Read this article for details of this operation. With the described functionality, Nimble Streamer and WMSPanel users get additional benefits of automatic infrastructure deployment, best resilience and reliability of their streaming processes. Today, surveillance cameras are common for security and monitoring. E.g., they are used to ensure the safety of educational institutions: kindergartens, schools, kid's clubs. Many people use cameras to track the progress of construction projects, and to protect the perimeter of protected objects. Often cameras are put in suburban homes, connecting them to the Internet. Parents, executives of construction companies and owners of country houses should be able to view the video streams from cameras on their mobile devices at any time. Nimble Streamer allows doing it via transmuxing RTSP stream from the camera to HLS for further viewing on any mobile device. Using of Nimble Streamer helps to reduce load on network channels between cameras and media server, and also helps to protect video streams from unauthorized viewing. Next we are going to show how to configure that. Nimble Streamer allows transmuxing the incoming MPEGTS streams for further restreaming via RTMP, HLS and MPEG-DASH protocols. Until recently, it was necessary to add MPEGTS streams one by one, which was very inconvenient in case of large number of streams. Live streaming of video over Internet gives a high load on the communication channels. To reduce channels load, and to increase robustness of live streaming the load balancing techniques are used (read the "HLS, DASH and Icecast streaming load balancing" article for details). Publish RTMP stream from an origin (or encoder) to an edge server. Edge server can pull RTMP streams. You need to specify IP or hostname of origin server (or encoder). For RTSP protocol the settings are performed using the same techniques. For SLDP, Icecast and SHOUTcast you can use only pull. You can read more detailed information about the creating of your live streaming network in the "Building RTMP live streaming network via Nimble Streamer" article. In current article we are going to show how to decrease network load by setting up RTMP, RTSP, SLDP and Icecast streams pull by request via Nimble Streamer. This technical blog is brought to you by Softvelum LLC, the company behind Nimble Streamer media server, WMSPanel streaming control panel and other media streaming products.